What do you normally do in your spare time? I was really challenged last week when i heard about Sok Sua and what he has been doing over the weekend. You might remember that he’s the guy who runs the Book Tuktuk, the Flame Mobile Classroom. He is remarkably tall for a Khmer guy, and has a huge smile. The kids adore him. He wears nice trousers, slim fitting and professional looking, he looks like he works in an office! And there he is, leading a wee crew of kiddies right in the heart of the local community, teaching them to read and write. He honours them by wearing nice clothes, dressing up for his job, he takes his role seriously. He knows the impact that he has, not just in terms of literacy, but in the value that he imparts to the kids by showing up day after day and caring for them. So, what does a guy like this do on the weekend? I heard that he was in a particularly low income area and randomly came across some kids. He stopped and bent down, and asked if they were in school. They weren’t lucky enough to attend school and were intrigued by this tall, friendly guy even noticing them. He paused and decided to spend a bit of time with the kids and do some ad hoc lessons with them, going over the alphabet and some basic number games… and they were delighted. He said later, that it’s not just the Monday to Friday that he’s interested in. These are his people. This is his country and these kids deserve an education. When he said goodbye to the kids, he gave them a little spending money, so they could buy a drink to share. What a heart this guy has. At Flame, it’s not just what we do, it’s who does it. If you want to help us help the poor, please consider donating. I met with a Flame Leadership Academy student this week, Veasna, who is working now for Flame on the social work team. She understands the value of learning and specifically of learning language. She is from a disadvantaged family herself - she knows exactly how hard it is for the Flame kids and has literally 'been there, done that". She knows first hand what commitment looks like and to this day has an unusual level of determination to make the most of the opportunity that she has been given. She attends university and gains work experience at Flame. She was telling me that when she goes home and visits with her younger siblings and mum they ask her about when she’s going to find a husband and get married, and she just shakes her head and says she just doesn’t have the space. She is single-minded in her focus to do her very best at university and to help the kids in Flame. She has had a glimpse of her own potential and fully believes that she is able to make a huge difference and NOTHING is going to stand in her way. She went on to explain to me, that in Cambodia, without a sold grasp of English, kids they will be isolated from the international community and disadvantaged in accessing the best materials for their studies. They will not be able to reach their full potential. When i visited her at the Flame Activity Centre in Sensok, Veansa pointed out to me one girl who was at our centre for the very first time. She is a bright 14 year old, in grade 8, but had never been able to attend English lessons and really lacks confidence as she knows she is behind and struggling to keep up. Her mother has HIV and is at the stage now where she isn’t mobile and has stopped eating, and even finds it hard to drink. What does the future look like for the eldest girl in a family which is losing its mother? Life is not fair. That’s for sure. I see kids who have been given a huge chance and their lives and futures will never be the same… and i have seen too many kids tagging along behind a parent pulling a cart of recycled plastic, barefoot and grubby, busy working to support their families. The number of kids that Flame can reach is limited by donations. It’s basic maths. We are increasing the numbers of university scholarships and opening our doors for more people like Vaesna but really need your help to pay for the scholarships. Please consider giving to the Flame Leadership Academy Program so that more people like Veasna can receive a university education and give back to the communities they came from. This is the full circle. Imagine a young girl walking along a dusty track between endless rice paddies. She has a skip to her step as she heads to the nearby volleyball pitch, net strung between two coconut trees. The sun is relentless in the Cambodian countryside, and she thinks nothing of her bare feet, enjoying the sense of being able to touch the earth, dust between her toes. The volleyball competition between the different groups of village kids isn’t the most important thing to her, it’s being able to escape from her 12 year old worries. She can shelve the stress she feels about her parents latest quarrel, the sulking refusal to join the family meal. She is distracted at school with thoughts that circle inside her head, wondering if her parents will stay together, wondering who she will find when she goes home. When she’s playing sport, she focusses on the ball and on her team mates, desperate not to let the team down, hoping to avoid any recrimination or blame for a fumbled shot or bad pass. She wants her team to know she is trying her best. She laughs out loud and loves sport. As an adult now, Navy brings these memories to her job at Flame. She is passionate about sport and believes that it’s not just about skills on the field. Sport is a way out of the mundane drag of life, an escape from the monotony of the slums. It’s football, of course it’s about the physicality of the sport, health and strength, balance and muscle development, but it’s so much more than that. The technical aspects of football can be summarised by how one team conquers another, but the process involves the kids brains as they learn to read the other team, communicate with their own team, maintain trust and relationships, and plan and strategise on the run. The skills learned on the field can be transferred to daily life. Growing up on the family farm in the Waikato, Sue Hanna’s passion for helping people was heavily ingrained from her childhood, which led to her current venture - helping Cambodian children living in slums complete their education - from primary through to university. With more than 25 years in leadership and ministry roles, Sue founded Flame Cambodia in 2015, alongside another fellow Kiwi, Nicola Palairet from Auckland, who is the current communications manager. Flame was created to connect with slum-dwelling children and inspire them to leave begging or rubbish collecting and start school or re-engage in education. The goal is that each child reaches beyond their potential. Currently, Sue facilitates foundational leadership training to young adults. She also mentors, motivates and encourages the staff who work in the centres with the children to help them to be able to do the work that they do. They have a team of 33 staff members throughout the different Flame programs such as three activity centres, a residential university scholarship program, leadership training and more. Sue calls the process of the children becoming a young leader “the full circle” and it involves three stages – identify, grow and launch. The activity centre staff work with children and their families to identify why they’re not in school. Often that’s due to low income or perhaps the parents are illiterate, so they can’t fill out the forms or the kids don’t have a birth certificate. ‘Grow’ is about keeping the kids in school, motivated, and passing their grades. The kids go to school for half a day, and the other half they go to one of Flame Cambodia’s three activity centres to do any catch-up work with staff to help them stay on track in school. As part of their ‘launch’ stage, Flame has university scholarships available and a leadership programme, so they strongly encourage the university students to come up with mini projects of their own that they would like to happen to help their people or the communities they came from. “Those kids are the future generation, and this enables them to learn a new skillset while giving back to their community. They emerge as confident leaders in their communities, inspiring others in education, service, and leadership,” Sue said. It was “wandering around the planet” on her OE and seeing poverty throughout the world that lead Sue to where she is now. “It had a huge impact on me and made me realise that I had the ability to make a significant difference in somebody’s life even if I didn’t know them,” Sue said. Upon her return, she worked for World Vision for 10 years as a territory manager in the Waikato, Bay of Plenty, King Country and East Coast. It was in this role that she visited Cambodia several times to see the work that World Vision was doing and collect stories to take back home and raise more money. “Cambodia got more and more under my skin every time I went, to the point that in 2004 I took some annual leave, went to Cambodia and decided I was going to find a Sue-shaped hole, because I knew there was something I could do there which was linked into those moments I had when I was travelling on my OE,” Sue said. Sue’s passion has always been to stand alongside the poor and disadvantaged, who have been written off by their own communities, and to help them. Her parents also held a desire to help people, so growing up, they always had extra people coming to stay in their family home. Sue said they would have people out of prison who would stay often for six months at a time, as well as missionaries who were overseas and had just come back to New Zealand. “As a child, I would just immerse myself into other people’s stories. I also read a lot of autobiography books, and I would imagine myself exploring and thinking this is what I want my life to look like,” Sue said. Sue has been living in Cambodia for the past 13 years, helping families through Flame Cambodia. However, they also have a New Zealand board, which includes Brian Trebilco from Te Awamutu, as the board chair; Greg Stocker from Pirongia as trustee; and Meredith Brocklebank from Auckland, who is the secretary treasurer. The name Flame comes from a biblical passage, where it talks about a flame which is nurtured and then it eventually comes to a point where it’s a fire on its own. Esther, the Flame photographer, will have her photos featured in the Have A Heart For Cambodia IMAGINE 2018 exhibition on 01 Sept, 2018 in Melbourne's famous Meat Market. They are part of a awareness-raising campaign about Flame and the urban poor of Cambodia. Esther will be there in person, and her work will be on live auction, with other items for sale. Come along if you're in the area and have a look at her latest work. Below is Esther's video, a heartbreaking account of her life as a child subject to the hardship of living in poverty. Esther graduated in June from the Royal University of Phnom Penh with a degree is sociology and works full time between Flame and another project among the urban poor children in the community where she grew up. We need your help to support young people like Esther. Go and see her work being displayed and join in the celebration of her success story. 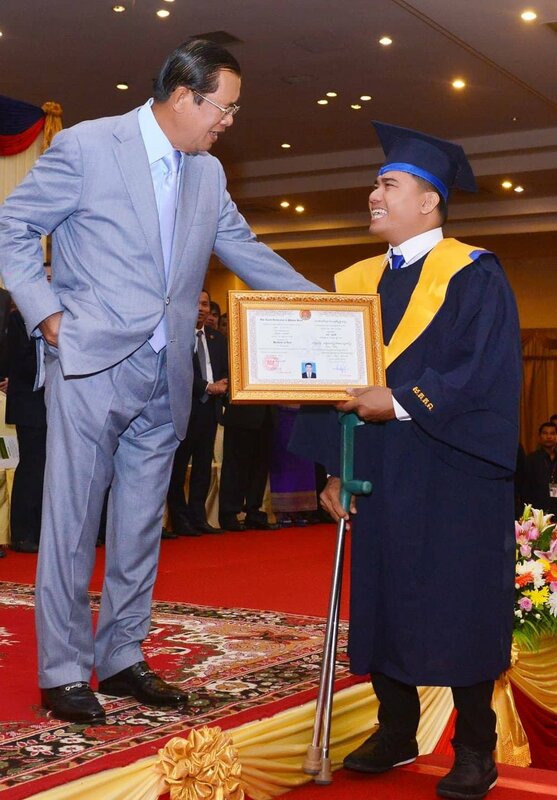 In June I attended the graduation ceremony for the Royal University of Phnom Penh. Prime Minister Hun Sen delivered the keynote speech so security was tight -the military and police presence blatantly obvious. My water bottle was emptied and my bag was x-rayed as I entered the huge facility. This was a major national level deal! I excitedly took my seat among the throngs. Of the over 3600 graduates, two were from the Flame Leadership Academy: Esther So (estherso_photographer on instagram) our Flame Photographer graduated with a sociology degree. You'll be hearing a lot more about Esther next week as she is heading to Australia and New Zealand to exhibit her photography... watch this space! The other student was Longdy Chhap, graduating with his psychology degree. The crowds were so large that there were multiple mounted television screens around the hall so that everyone could see the President hand out the degrees... except only 10 graduates were chosen to receive their degree on the stage -shake with the right, receive with the left! Longdy is outstanding, and of the 10/3631 ... what a privilege to shake hands with the President! Longdy was one of the ten. Maths isn't my strong suit but even I could tell that this is a huge achievement, and a testament to Longdy's hard work and commitment. Longdy has been accepted into the Masters of Clinical Psychology program and will start that next year. In the meantime he's working and continues to come to the Flame Leadership Academy and helps with translation and counselling of our young leaders. Thank you for your support to put these young people through university and to help the families of the kids in the poorest urban communities of Phnom Penh. We need your help to get more kids into school, and to give them the chance of being university graduates like Esther and Longdy. Please give discerningly and generously to something that really does work.